In comparison to the past week, the intensity of shelling significantly increased. 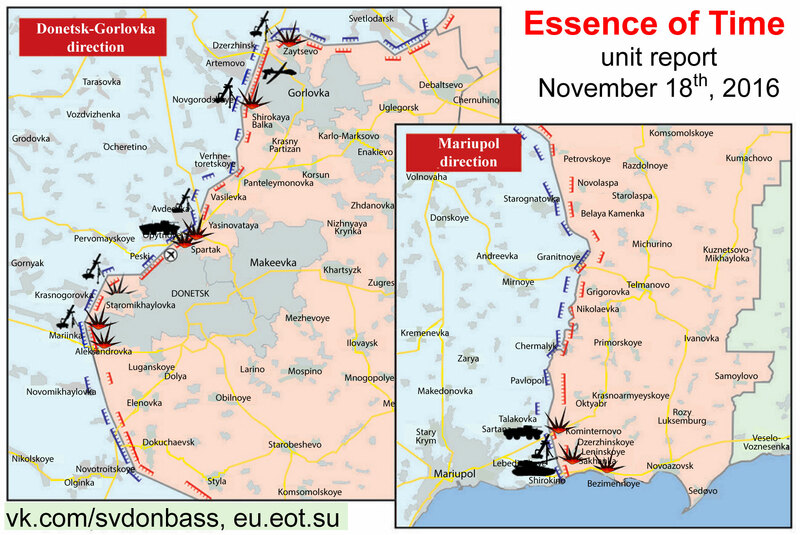 Armed Forces of Ukrainian provoke trench combat on all main sectors of the front. Throughout the day Armed Forces of Ukraine keep firing on northern and south-western outskirts of Gorlovka by artillery, grenade launchers and small arms. The enemy uses drones to adjust fire. By the evening the intensity of shelling increased in the area of Zaytsevo village. Armed Forces of Ukraine shelled Avdeevka industrial zone, Spartak, Staromikhailovka, Trudovskie and Aleksandrovka villages on the Donetsk sector of the front. In the evening intensive trench combat started north of the capital, artillery, grenade launchers and large-caliber machine guns were fired. Ukrainian army once again opened fire on Kominternovo, Sakhanka and Bezymennoye villages on Mariupol sector of the front. Artillery, IFV guns and small arms are being fired. In the past seven days DPR recon registered “Grad” multiple rocket launcher division and a battery of 120mm mortars. A platoon of tanks, a platoon of “Giatsint” self-propelled artillery guns (SPG), a platoon of D-30 howitzers and two 120mm batteries were accumulated by Armed Forces of Ukraine on Donetsk direction. A platoon of tanks, “Akatsiya” SPGs, platoon of “Giatsint-B” SPGs, a battery of “Gvozdika” SPGs, a platoon of D-30 howitzers and two 120mm mortar batteries were spotted near Mariupol. The enemy actively uses recon drones to adjust artillery fire. In the past week Armed Forces of Ukraine opened fire 6467 times on frontline areas of the Republic, including 2795 times by artillery systems. 25 towns and villages of DPR were shelled. One civilian was killed.